TripAdvisor (NYSE: TRIP) announced its 2017 Q4 earnings results on Feb. 15, 2018. The results announced were above the company’s expectations wherein it beats the revenue estimates by $8.83 Mil registering y/y growth of 1.6%. The company missed the earnings estimate, but the stock price has moved up due to the positive guidance for future growth prospects. The results were primarily driven by strong performance in the Non-Hotel business segment and also, due to the stabilization in the click-based auctions. Non-Hotel revenue grew by approximately 18% in 2017 Q4 in comparison with the same period last year. This segment is expected to drive results for FY2018 as well. 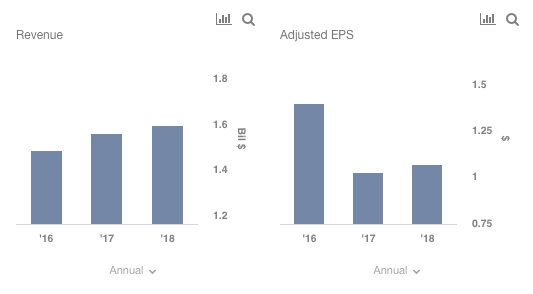 Consensus for Adjusted EPS for FY18 is about $1.05. We have created an interactive dashboard to showcase the performance of TripAdvisor in 2018. Hotel Segment: This segment, which constitutes almost 75% of the company’s revenues, has been struggling to perform well over the quarters despite its huge investment in TV Ads. Although, it might revive in the long run as the company is focusing on three major areas which are amplifying their consumer message through brand advertising, improving product experience, and also by optimizing the marketing mix. Steps that were taken to achieve these are: introducing more streamlined hotel pages, refreshed the look and feel of the products, making the platform more user-friendly and with its improved tracking capability, the company is trying to reduce investments towards unprofitable traffic. Non-Hotel Segment: In 2017 Q4, this segment grew by almost 18% and is likely to continue to register growth for FY18 as well. The growth will mostly be driven by the increase in the Attractions and Restaurants business which deepens traveler engagement with the platform. If we look at the supply-side, the growth in bookable product accelerated in Q4 to 48% and it now offers users a selection of more than 83,000 things to do on a trip whereas, on the demand side all the key channels saw the traffic increase from mobile to SEO, to multilingual. TripAdvisor is also investing to enhance the product experience to broaden the marketplace and also, to grow bookable supply further. These steps will help the segment to deliver better results. The company expects the performance of adjusted EBITDA and consolidated revenue for 2018 to be second half-weighted. This will be driven by brand marketing investments in the first half of 2018 which were not in the period one year ago. Additionally, tougher first half year-over-year comparisons, coupled with optimized marketing mix, will result in lower Hotel segment revenue in 2018 compared to 2017. This is expected to result in a smaller adjusted EBITDA decline in 2018 as compared to 2017. 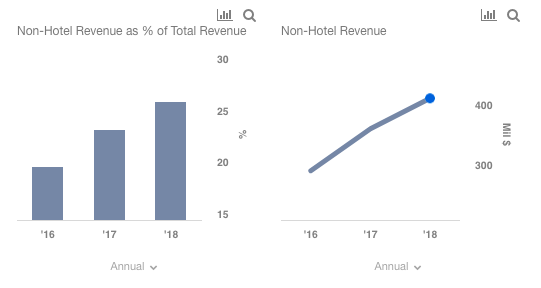 For the Non-Hotel segment, strong revenue growth is expected at similar levels as of 2016 and 2017.